German Chancellor Angela Merkel stated unequivocally that "Turkey should not become a member of the EU," and that stalled ascension talks should end, in a televised September 3 political debate. Turkey will never become a member of the European Union, and German Chancellor Angela Merkel finally said so in public. 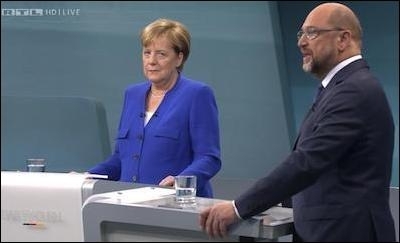 "The fact is clear that Turkey should not become a member of the EU," she said in an election debate with her opponent, Martin Shulz. "I'll speak to my colleagues to see if we can reach a joint position on this so that we can end these accession talks." The only thing surprising here is that it has taken so long, but Merkel is at last willing to effectively call a dictatorship a dictatorship now that Turkey is imprisoning German citizens, including journalists and human rights activists, and accusing them of belonging to terrorist organizations and attempting to overthrow the regime. Western countries refer to such people as "political prisoners," and European Union states are emphatically not allowed to keep political prisoners. The notion that Turkey might conceivably fit inside the EU has always been a bit of a stretch, and it has been especially ludicrous since last summer when a botched coup attempt triggered a Stalinist spasm in Ankara. Within just a couple of weeks, Erdogan fired more than 20,000 private school teachers and almost 10,000 police officers. He suspended nearly 3,000 judges and arrested more than 10,000 soldiers. He canned tens of thousands of officials from the Ministry of Education and ousted 1,500 university deans. He closed more than 100 media outlets and suspended more than 1,500 officials in the Ministry of Finance. European officials understand that Turkey can never join the EU after what's happened in the last year. And from there, it only got worse. In April, Turkish voters narrowly decided to scrap their parliamentary system and replace it with one that gives vast new powers to President Recep Tayyip Erdogan, making him an elected dictator in all but name. Erdogan, writes Turkey expert Claire Berlinski, "who would wield power not vested in Turkish leaders since the sultans, is actually a neo-Ottoman." The "everything else" part of the equation was hard for some people to see for a while, but it's not anymore. No, Erdogan isn't even in the same time zone as ISIS. He is, however, in the same time zone as Venezuela's late Hugo Chavez, minus the Bolivarian socialism, and as Vladimir Putin in Russia and Alexander Lukashenko in Belarus. All are (or in Chavez's case, were) authoritarian demagogues with just a veneer of democratic legitimacy, the kind of rulers often produced by nations that are influenced in part by the West while at the same time standing outside it. European officials almost certainly know, to a person, that Turkey can never join Europe after what happened last year. Its largest city, Istanbul, is in Europe, but its capital is in Asia, as are most of its people. Some quarters of Turkish cities look and feel European, for sure, especially compared with the vast majority of Arab cities, but Turkey is a cultural hybrid. Like Lebanon, Armenia, and even Russia, it's a place where the East melds with the West into an alloy. Westerners can and do feel at home there in ways they never can in a country like Saudi Arabia or Pakistan, but the cultural overlap is only 50 percent at the most, and Turkey's political overlap under Erdogan is withering. Westerners kidded themselves about Erdogan and Turkey for years. That ended a while ago. What's new here is that at least one European head of state is willing to bury the story we told ourselves once and for all. Others will almost certainly follow.